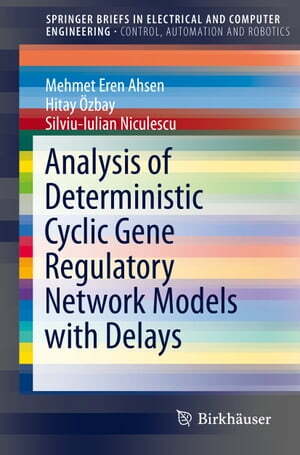 Collins Booksellers - Analysis of Deterministic Cyclic Gene Regulatory Network Models with Delays by Mehmet Eren Ahsen, Hitay Özbay & Silviu-Iulian Niculescu, 9783319156064. Buy this book online. This brief examines a deterministic, ODE-based model for gene regulatory networks (GRN) that incorporates nonlinearities and time-delayed feedback. An introductory chapter provides some insights into molecular biology and GRNs. The mathematical tools necessary for studying the GRN model are then reviewed, in particular Hill functions and Schwarzian derivatives. One chapter is devoted to the analysis of GRNs under negative feedback with time delays and a special case of a homogenous GRN is considered. Asymptotic stability analysis of GRNs under positive feedback is then considered in a separate chapter, in which conditions leading to bi-stability are derived. Graduate and advanced undergraduate students and researchers in control engineering, applied mathematics, systems biology and synthetic biology will find this brief to be a clear and concise introduction to the modeling and analysis of GRNs.